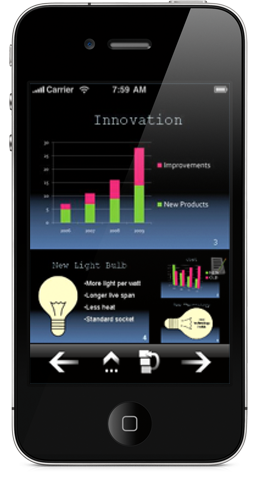 July 16, 2012 - Didonai launches MyPoint PowerPoint Presentation Pro (MyPoint Pro) for iPhone and iPad. The new app builds on the most popular PowerPoint Remote Control app for the iPhone: MyPoint PowerPoint Remote. In addition to all of the original MyPoint features, MyPoint Pro offers native iPad support and the ability to load presentations on your mobile device and show them without the use of a computer. Once a PowerPoint Presentation is loaded onto an iPhone or iPad, you can rehearse or give a presentation directly from the mobile device. The MyPoint Pro can be used outside of the office, and boost more intimate one-on-one presentations. Moreover, MyPoint Pro can be hooked up directly to a projector via a VGA adapter (iPhone 4/4S, iPad and iPad2) or stream your slides to an Apple TV (iPhone 4S and iPad 2/3 only) - no computer necessary! MyPoint Pro has native support for the iPad with both portrait and landscape modes, and the option to view the slides in fullscreen. For presentations with slides that have animation, users can view either the full slide preview or the current screen. Customizable features such as the choice of multiple pointer shapes make your unique presentation even more distinctive. MyPoint Pro also allows the presenter to blank out the presentation screen without loosing place in the presentation, and extended features including a marker and timer that are available for In-App purchase on the original MyPoint are included in MyPoint Pro for no extra charge. At Didonai, we believe that combining new and well-established technology can provide tremendous benefits. In the area of information technology, the connection between old and new comes basically down to "data" and its representations. "Data" in Latin interchangeably means "to give," which leads us to "Didonai" meaning "to give" in the old Greek language. With choosing "Didonai LLC" as our company name we want to show the appreciation for our roots in ancient cultures like Greek, Roman, and others, which still influence us today and GIVE us the opportunity to create innovative solutions that benefits the users of our solutions now and in the future. 1. MyPoint, which enables you to remote control PowerPoint presentations on your PC/Mac significantly improving the experience for both the presenter and the audience. 2. My Computer Data, which let's you view various types of computer data from your iPhone/iPod/iPad. The company founders have a diverse background, combining different cultures in three continents, and share a passion to excel in designing, developing, testing, and supporting software solutions. The technical background goes back from programming computers that were build 45 years ago all the way to the latest personal computer, network, and mobile device technologies. We are using this unique mix of experience, skills, and mindset to fulfill our company mission: Enhance the use of existing computer applications and data via mobile devices.